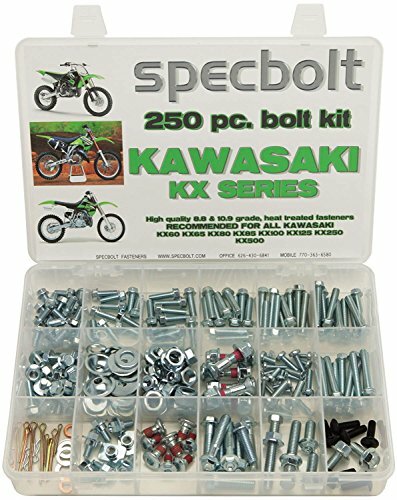 This Specbolt 250 piece kit will save you many trips to the dealership for that special OEM fastener needed for all liquid cooled Kawasaki KX 2 Stroke models. This includes KX60 KX65 KX80 KX85 KX100 KX100 Big wheel or Expert KX125 KX250 and KX500. Your Bolt Kit will include just the right amount of factory match flange bolts, chain adjuster bolts, sprocket bolts, 6 fork guard bolts, flange nuts, lock nuts, sealing washers, fender washers, Philips screws, Allen bolts, and more. Most everything you need to perform basic maintenance and upkeep to your Motorcycle. Assortment of bolts used for plastic, fenders, bodywork, fork guards, full rear sprocket set, chain adjusters, engine cylinder and head, frame components, seat, fuel tank, controls, carburetor, exhaust, pipe, silencer, radiators, handlebars, swing arm components, skid plates, and more. These fasteners meet or exceed quality standards of your machine's originals. A perfect addition to the racer's tool kit and a must have for the do-it-yourself mechanics. If you have any questions about this product by Specbolt Fasteners, contact us by completing and submitting the form below. If you are looking for a specif part number, please include it with your message.